The Golden Thread Gallery is delighted to be starting the New Year with a new exhibition by Dublin based artist Vanessa Donoso López. There is an opening reception on Thursday 11th January between 6.00 & 8.00pm, do join with us and take the opportunity to meet Vanessa and preview the exhibition. Vanessa Donoso López born 1978 in Barcelona lives and works in Dublin. Her work features “observations of language, cross-cultural identity, acculturation processes, homesickness and the compatibility between cultures that are continually present”. I was drawn to clay as much for its immediacy, direct expression and tactile responsiveness as to its commonplace status, metaphorical associations, and broader cultural implications. I was powerfully seduced by its possibilities for collaboration and interaction with a range of people and its strong associations of going back to basics and our collective human memory. I gathered soil from three different relevant locations in Spain. Utrilla, in the Spanish midlands, Alanís de la Sierra (during my residency in Casa de las Artes, Alanís) in the south of Spain and Camallera (during my residency in Nau Côclea) in Girona, north of Catalunya. Then, soil was processed and clay extracted. 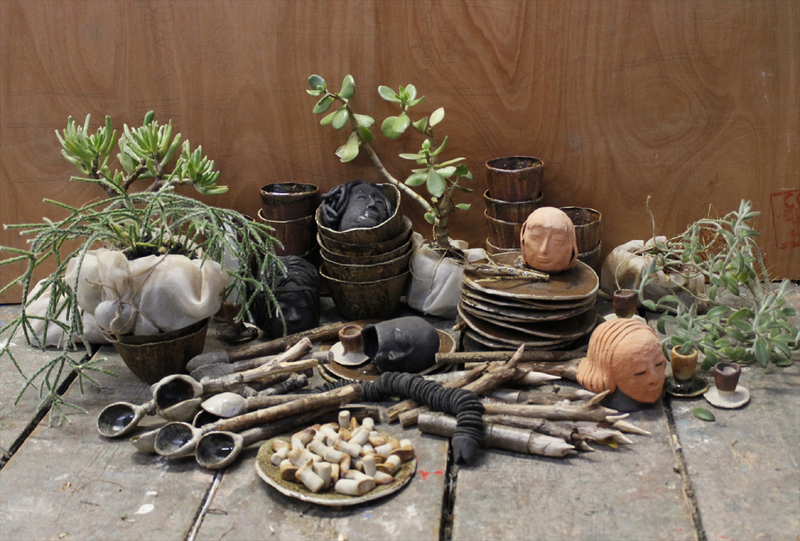 I made familiar multi-cultured clay objects that will first engage with real life, then later transforming themselves into sculptures as a way of defying the function of the domestic object. Prior to the opening of the exhibition, a meal was organized for the gallery personnel. In all societies, eating is a powerful way to initiate and maintain human relationships. The way of eating links with the group itself and its history and it has a huge force of evocation of intimate and primal experiences. For this meal, a traditional La Mancha soup, was served in bowls made with clay from Utrilla, salads with Girona recipes, were served of plates made with clay from Camallera, and wine from Andalucía was served in cups made from Alanís clay. The gallery will become a transitional space, the dinner will work as a bridge, and the plates, the spoons, the forks, the cups and bowls will turn into tools as extensions of our bodies. Clay is a recorder of marks, and on clay was found the first evidence of the written word which starts with cuneiform script inscribed into clay slabs. It has deep literary history and relationship to narrative. On clay slabs was written the ‘Epic of Gilgamesh’, which is the oldest piece of literature ever found, written on 2100BC by the Sumerians. The main characters of this Epic, shared a meal and told their story. Clay presents itself as a historic super-material that works as a catalyzer being able to link physical experimentation to multi layered histories and multicultural interactions.